It’s not really Chris’s (no last names please) fault. I could have said no and I had. I am an adult and must take responsibility for my actions. Just to get it out of the way up front, I am the dovetail guy. The lost soul with 473 pictures of dovetails on Flickr. I started to take pictures of furniture because I was seeing things I hadn’t seen before. There are weekly auctions and a few good antique shops in my area and I have a curious mind. I started taking pictures of the dovetails because the things I was seeing didn’t match conventional wisdom, 1 in 8, 1 in 6, or 1 in 4. Another Chris (no last names please) (Mainely know for his fine woodworking) insists you should not make your pins too small or they will fail. It’s like our woodworking ancestors didn’t know the rules or chose to ignore them. Could be they were just people trying to make a living. I do want to know how and why they made pins thinner than the kerf of any saw I own. It has eight outside corners and four inside corners. The outside corners look mitered but are really fully blind, mitered dovetails. The inside corners are dovetailed. The lift out tray is mitered but the drawer is dovetailed. 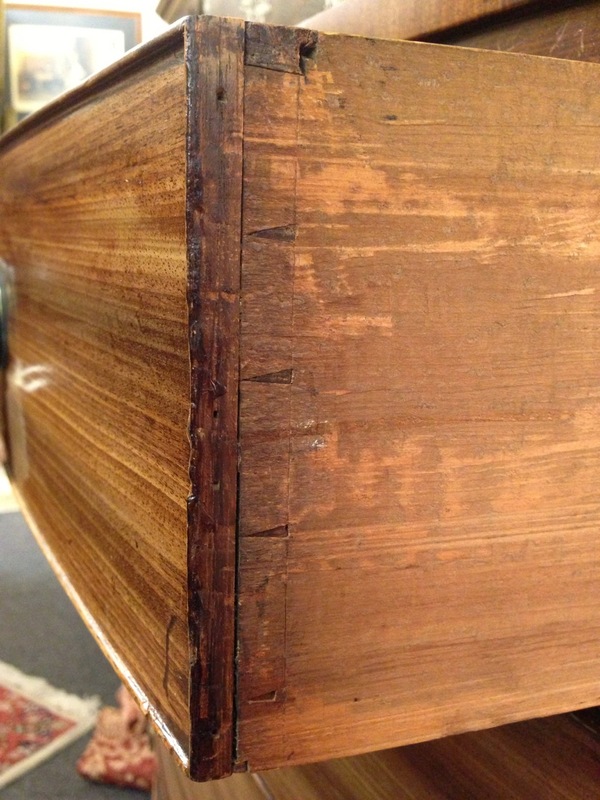 The box was built as one piece with the lid sawed from it. It came from the Atlanta area and if anyone knows (or cares to speculate) as to why it exists, please let me know. The box is 22″ long by 11″ deep by 9 7/8″ tall. Case wood is 21/32″ thinned down to 3/8″ on the sides. The bottom started life as a single board with the grain running front to back and nailed on. It has some issues. Till is 20 9/16″ by 3 1/2″ by 1 1/2″. Front and back of the till are 3/8″, ends are just under 3/8″ with a 3/16″ bottom.